We already knew the singular focus for the Philadelphia Eagles was on repeating this year, but we never guessed that meant another incarnation of that exquisite Philly Special play call, this time against the Atlanta Falcons in Thursday night’s NFL regular-season opener. Who said you can’t use the same trick twice? If this keeps up, the defending Super Bowl champion Eagles are going to have to start paying Nick Foles as a quarterback and a receiver. 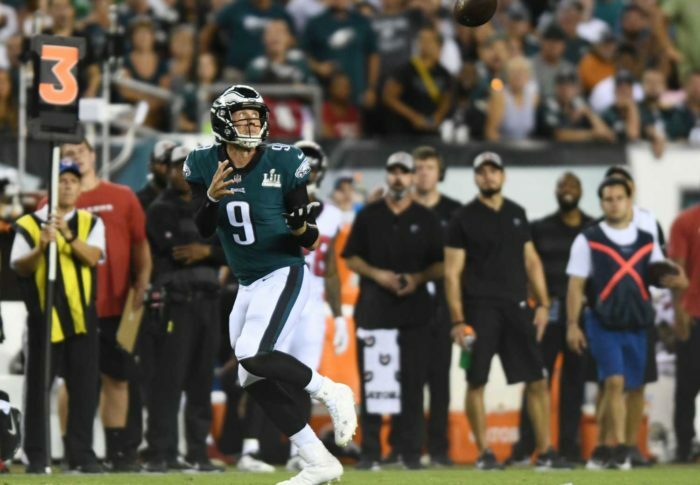 Score another one for the imagination and moxie of third-year head coach Doug Pederson, because once again the Eagles fooled their opponents with a creative and well-timed call that served as the centerpiece moment of their 18-12 opening-night victory. And just to add an extra dose of irony to the Eagles’ defense-led triumph, this time their bit of razzle-dazzle was stolen directly from the playbook of none other than the New England Patriots, the team they vanquished in last February’s Super Bowl LII in Minneapolis. This time the trick play came on a third-and-5 from the Atlanta 41-yard line, deep into the third quarter. The Eagles trailed 6-3 at the time, and had looked lackluster and lethargic on offense throughout the game. Foles took the snap and pitched to running back Corey Clement, who flipped it to receiver Nelson Agholor. Showing nice touch, Agholor lobbed a perfect pass back to Foles down the right sideline for a 15-yard gain, Philadelphia’s longest of the game to that point. The call sparked the drive that resulted in the Eagles’ first touchdown of the season, five plays later, when running back Jay Ajayi scored from the 1. The Patriots had run just such a play against the Eagles in the Super Bowl, only to have a wide-open Tom Brady drop the pass from receiver Danny Amendola. Meanwhile the Eagles executed their trickeration perfectly in the Super Bowl, with Foles catching that 1-yard pass from tight end Trey Burton on fourth down — with Clement again the middle man — to put Philadelphia up by 10 at halftime. Make no mistake, Philadelphia’s use of a pivotal trick play was not the only almost eerily repetition we saw in the first game of the NFL’s 99th season. Once again, just as they did in last January’s ugly 15-10 loss at Philadelphia in the NFC Divisional round, the Falcons offense failed because of its horrible lack of execution in the red zone. Be it on offensive coordinator Steve Sarkisian for his uninspired play-calling, or quarterback Matt Ryan for coming up small when the end zone is within reach, Atlanta did nothing against the Eagles to change the scenario. Five times the Falcons drove inside Philadelphia’s 20, and all they had to show for it at game’s end was nine points — one touchdown, one field goal and one missed extra point. Atlanta’s opening drive of the game failed at the 1 on fourth down, and the Falcons’ final drive of the game failed at the 5 on fourth down. That’s really all you needed to see on this night to tell the story of the game. Just like in the playoff game against the Eagles, Ryan’s final pass was in the direction of Julio Jones, who this time caught the ball, but well out of bounds, ending Atlanta’s hopes for a last-second victory with a hopeless and questionable decision. The Falcons had a first-and-goal from the 10 and wound up firing four incompletions. And now the pressure is back on Sarkisian and Ryan for being really good, until it really matters. What did we learn about Philadelphia and Atlanta in Week 1? Not much we didn’t already know. The Eagles have a go-for-broke, “why not” mentality when it comes to play-calling and creating their own breaks, and the Falcons tighten up and flounder on offense when they are within spitting distance of the end zone. So far, the NFL’s new season looks a lot like last season.